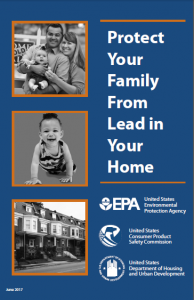 We welcome the efforts of the three agencies that author the booklet: EPA, Department of Housing and Urban Development, and the Consumer Product Safety Commission. 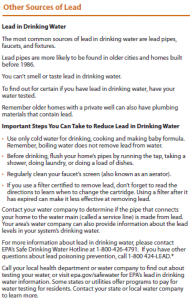 The changes significantly improve the booklet by incorporating what we now know about the risk posed by lead in drinking water and methods to reduce exposure. With the next revision, the agencies should consider using more graphics to more effectively communicate to readers. The current version relies heavily on text to convey the message. The scientific evidence on risk communication makes clear that many people learn more when text is supported by clear graphics. With millions of prospective tenants and homebuyers getting this booklet every year, it is imperative that it be as effective as possible for all readers to better understand the risks of lead and concrete steps to reduce exposure. This entry was posted in Drinking Water, EPA, Health Policy, lead, Public Health, Regulation and tagged CPSC, disclosure, EPA, HUD, lead, Lead in Drinking Water, lead paint, renters. Bookmark the permalink. Both comments and trackbacks are currently closed.